One of the best things about summer is the arrival of local grown strawberries. They will appear at farm markets and at local farms where you can pick your own. I have picked them a couple of times and that is really hard work. Strawberries are available year around here in the USA, thanks to California. But I really prefer the Michigan strawberry. The local berries are smaller and sweeter than the ones produced by California. (That is my opinion, obviously.) I have two favorite strawberry desserts that I make and usually only make them when local strawberries are available. “The first documented botanical illustration of a strawberry plant appeared in 1454. The ill-fated Queen Anne Boleyn, the second wife of King Henry VIII had a strawberry shaped birthmark on her neck. Supposedly, this proved she was a witch. I found this wonderful recipe for Strawberry Cream Pie just last year. It is exactly the kind of pie I had been wanting to make over the years. It has a whipped cream and cream cheese filling beneath the glazed strawberries. And what I especially like about it, the glaze is made from all natural ingredients, not red jello or a pouch from the local grocery store. This recipe is from Leigh Anne who has a very interesting blog, Your Home Based Mom. Her blog has more than just recipes. She blogs about Parties, Crafts, and Home Décor. Be sure to visit her web site. The recipe on her web site includes directions for homemade pie crusts to go with this pie. Prepare pie crust as directed on package for one-crust baked shell. Set aside until completely cooled. Crush 1 cup strawberries. Combine 1 cup sugar and cornstarch in small saucepan. Add water and crushed strawberries. Cook and stir over medium heat to boiling, stir constantly until clear and slightly thickened. Blend cream cheese and sugar. Stir in vanilla. Fold in whipped cream. Spread evenly in cooled crust. Refrigerate for a few minutes. Place whole strawberries stem side down on top of creamed filling, pressing slightly. Spoon glaze over the berries. Chill for 3 hours. Be sure to make this pie a summertime tradition. I pressed the cooked glaze mixture through a fine mesh strainer in order to have a more smoother glaze and allowed it to cool slightly before spooning over the berries. 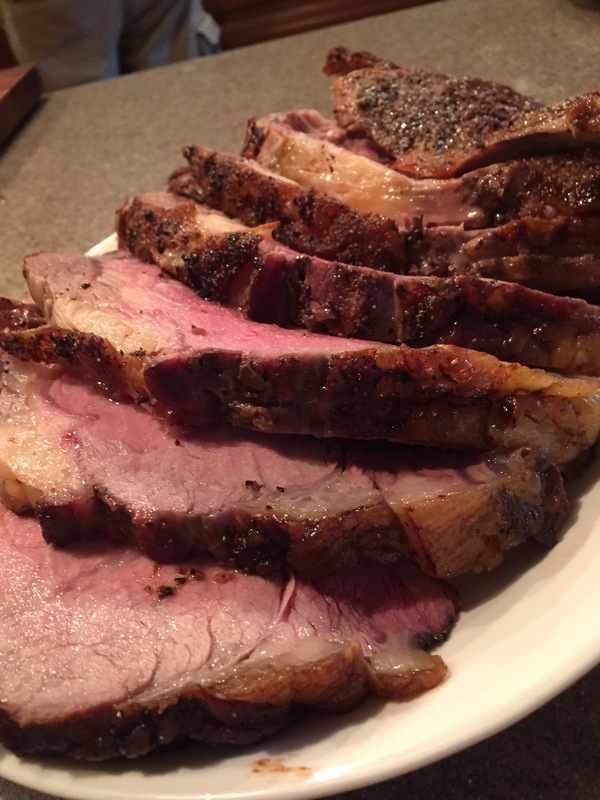 Prime rib roast also known as a standing rib roast is always a good choice for a special occasion dinner. Think of the upcoming Father’s Day to possibly serve it. There is no doubt that it is a pricey cut of beef. If you belong to either Sam’s Club or Costco, I have seen them there at a more reasonable price. Wherever you purchase the prime rib, ask the butcher to cut and tie it for you. This is simply where the butcher cuts the meat off the bones and ties it back on, which helps in the carving process once the roast is cooked. 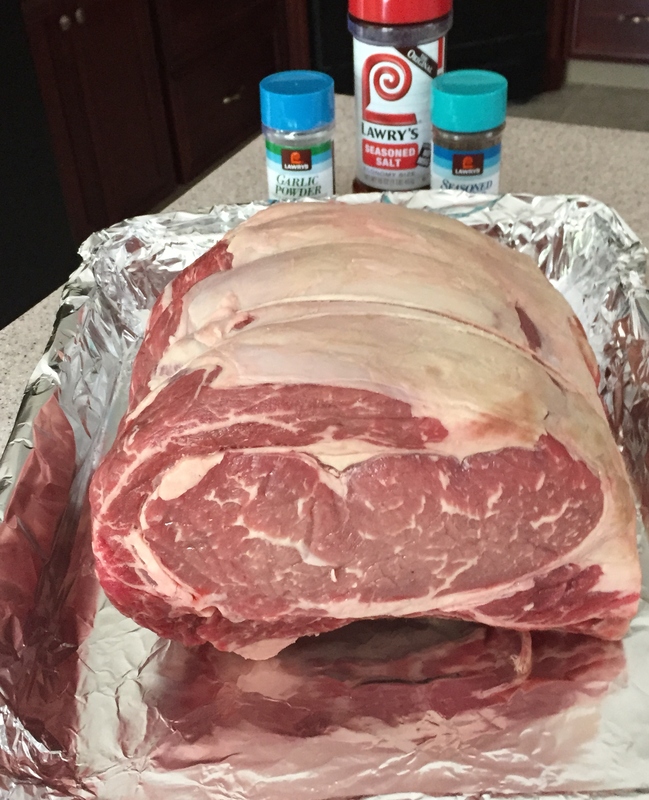 Prime rib has always been one of my favorite cuts of beef to roast. When roasted properly, you will have a juicy and tender roast beef. Some recipes suggest starting the roast out at a high heat (500 degrees). I prefer roasting at a medium temperature (350 degrees) and I only season with salt, pepper and garlic powder. This will result in a beautiful, flavorful and well-browned exterior of the roast. I like to add whole new seasoned potatoes to the roast about midway through cooking time but that is optional. Our love for roast beef in some form has been around for a long time. There is a reference by a Swedish diplomat named Kalm on a visit to England in the 1600s. 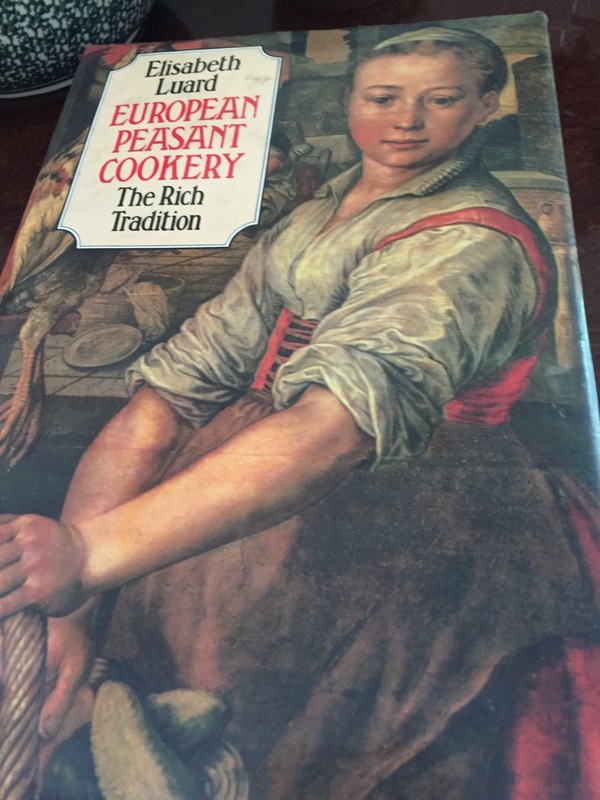 He commented on the English at table: “Roast meat is the Englishman’s ‘delice’ and principal dish.” Source for the above is taken from a lovely cookbook by Elisabeth Luard European Peasant Cookery The Rich Tradition. “To roast a Chine, Rib, Loin, Brisket, or Fillet of Beef. May’s 1660 cookbook is another free online cookbook available from Project Gutenberg and can be found here. Remove the roast from the refrigerator and let it sit at room temperature for 30 minutes to one hour. Preheat the oven to 350 degrees. Combine the seasoning ingredients. Place the roast, fat side up in the roasting pan. Rub the roast generously with the seasoning mix. Place a thermometer in the center of the roast or use an instant read one at different time intervals. Roast uncovered at 350 degrees for approximately 3-4 hours or until meat reaches desired doneness. Suggested temperatures are 115°-120°F for rare or 125°-130°F for medium. It is important to remember that the temperature of the roast will continue to rise after it is taken out of the oven. Transfer the roast to a cutting board and let rest for 30 minutes. Snip the tied bones off the roast before carving. Serve the roast with horseradish cream sauce if desired. 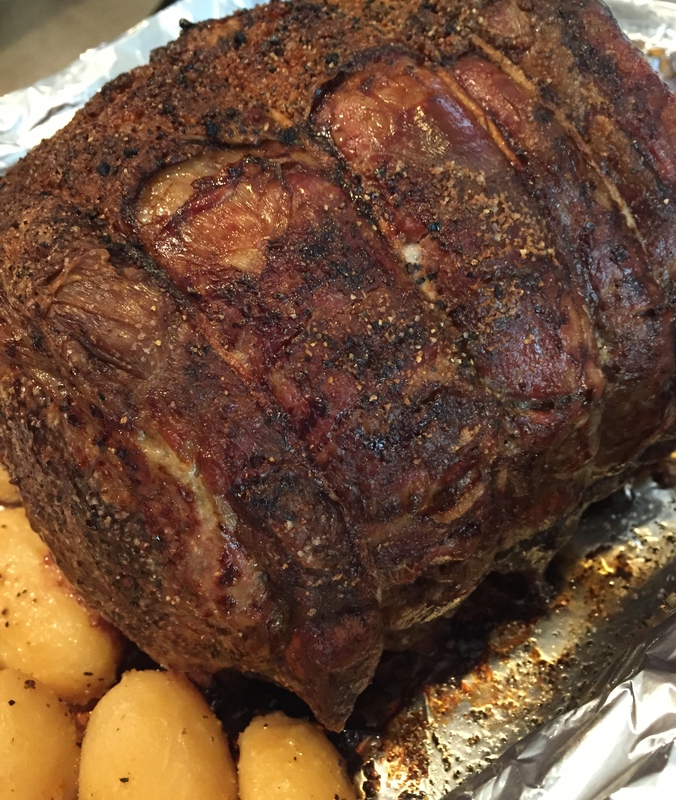 If you decide to cook a prime rib roast, you will discover that it is easier than one might think.